1837. The English loved their young Queen Victoria, but her mother? Not so much. She was German, a Saxe-Colburg, and many fretted about an increasing European influence on England when, in 1840, Victoria married her cousin Albert (Albert's father was Leopold, King of the Belgians). Albert brought change, a stringent morality for one thing, as well as the holiday customs of his homeland--the Advent wreath, St. Nicholas, and hymns such as Silent Night. The new royal family, after all, was able to sing it in its original German. 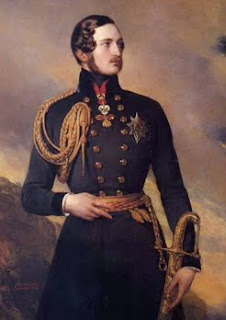 Perhaps The Prince Consort's best-known Christmas contribution was fresh cut evergreen trees. The first royal tree was set up and decorated at Windsor Castle in 1841. Within a few years, illustrations of their trees were published in London and New York. The practice had already come to the United States with German immigrants, but did not become widespread until it became ‘fashionable’. Prior to this, Christmas was a quiet day celebrated with a church service and for some, a special meal. It was not considered a holiday until well into the industrial revolution when the new middle class began exchanging gifts and giving to the poor. Workers were given a day off. WooHoo! Factories made gifts affordable to all children and by the 1870s, Father Christmas began bringing gifts to children. Of course, Victorian traditions grew out of the variety of established European customs. More on ‘Santa’ later. 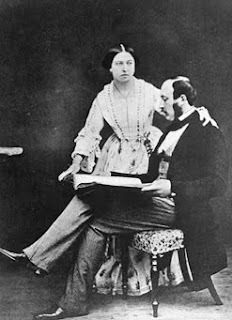 The Victorians' love of music prompted a renewal of medieval carols. New, light-hearted songs such as “O Christmas Day” and “I Heard the Bells” became popular when family and friends gathered in the parlor after their meal. From this grew the practice of Caroling, as it was already customary for families to travel from house to house at Christmastime and the New Year. Do you have your wassail recipe handy? One special Victorian tradition that hasn’t thrived in the US is the Christmas Cracker, invented in 1847 by Tom Smith, a baker who started making a version of the French BonBon, a sugared almond wrapped in a twist of fancy paper. To stay ahead of his competition in later years, Tom decided to add little gifts inside the twist and most importantly, a way to make the package POP when opened. Experimenting for years, Tom finally found just the right chemical compound that was safe, yet would still deliver the needed bang. In 1860 he achieved success and with the popping mechanism added, orders were flying out the door, or should I say “business was booming”? I can’t leave two other 19th century gentlemen out of this post. 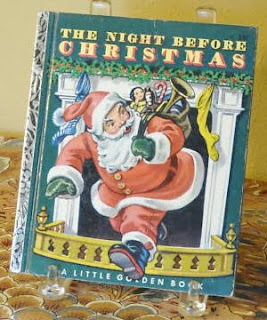 Most responsible for our notions of a Victorian Christmas is Charles Dickens and his serial story, “A Christmas Carol”. 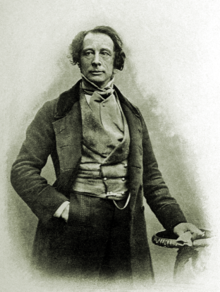 Dickens' later described the holidays as "a good time: a kind, forgiving, charitable, pleasant time: the only time I know of in the long calendar of the year, when men and women seem by one consent to open their shut-up hearts freely, and to think of other people below them as if they really were fellow-passengers to the grave, and not another race of creatures bound on other journeys". Hmmm, I guess that hasn’t changed either. Now, to 'round' out the holiday . . . Columbia University professor, Clement C. Moore, set the standard for Santa Claus when his poem “A Visit from St. Nicklaus”, written for his children, was anonymously published in an 1823 upstate NY newspaper. Please note this was before the Victorian era. 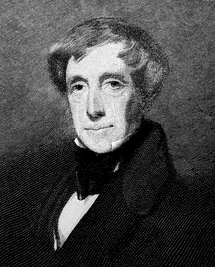 His children included it in an 1840s anthology of his written works and the poem, better known as Twas A Night Before Christmas. set the standard for all 'right jolly old elves' to follow. One hundred and seventy years later, our Christmas traditions are well-rooted in Victorian details. Thankfully, the ethnic flavors of our many cultures have only enriched the holiday. Somewhere a gentle holiday celebrating the gift of the Christ Child to a fallen world went kaflooey. Too much Santa and not enough Christ! Too much stress and not enough joy. I see a new trend of simplifying, slowing down the spending and commercialization. How have you found a way to simplify, without giving up all the traditions you enjoy? What family tradition can you trace back to your ancestors? I wish you a peaceful, old-fashioned "Happy Christmas" this year and a chance to rediscover the joy of Christmas Past. Thanks for stopping in on a busy day. I'm going to be very busy at work today, so I may not be able to comment until lunchtime. 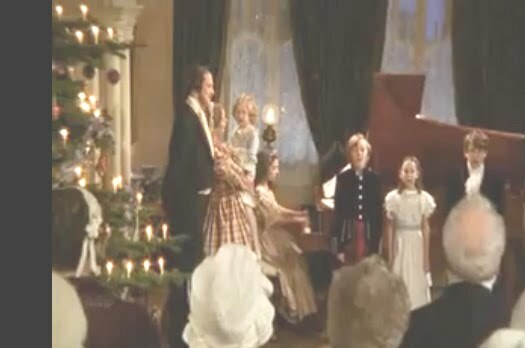 The camera shot above of the royal family's Christmas tree, is not one I took while visiting Vicky and Bert, but a still from the A&E miniseries Victoria and Albert. I loved this, Deb. I knew some of this history, but not all. It can be a crazy whirlwind... I close my eyes and pray for His peace to rest upon me when the pressure gets to me. Breathe, pray, love, eat.... not necessarily in that order! Oooh, I love learning new things! Thanks, Deb, for sharing these fun facts about Christmas history. So last night some friends were over visiting and the mom asked Niley (my 3-yr-old) if she was ready for Santa to bring her presents. I never cease to be amazed by the changes that have occurred just in the last two centuries. We're trying out a "freegan" Christmas this year -- nothing purchased new, just homemade, recycled, thrifted gifts. DD and I love it... we've been crafting like crazy people. It's a lot easier to remember Christmas while sewing and gluing than it is while shouldering through crowds and fighting the roads. Hubby, however, seems to think it means we aren't having Christmas and is making plans to go visit his cousins. Great post, Deb. I knew the origins but not really how they were carried across the channel. Good stuff. Thanks. We're having a traditional Christmas watching Christmas movies, listening to secular and Christian music, Christmas baking, gifts, decorations etc. I do have to put my foot down with the movies and music though because Nelson and the boys want to bypass the Christmas stuff for the usual. Jessie flew home on Friday and is standing by me that Dec is for Christmas themed as they can watch/listen to the normal stuff the other 11 months of the year. Thanks Ladies. I'm craving a Christmas cookie for some reason. In my immediate family, we aren't exchanging gifts, just hanging out and eating. Of course this doesn't apply to my grandchildren. I'm sure the 2+ year old would not know but we could never live with ourselves if the truth came out that she didn't get a thing under the tree! On that matter - I'm still sewing for her each night to be ready by friday. Thanks for sharing your thoughts today. I'm back to work...see you later. oh, hey, does anyone here like plum pudding? Deb, I love this post! This stuff is so much fun to me. And you included one of my favorite Dickens quotes. It always gets me! We're pseudo-"Christmas Carol" junkies and we read it annually. 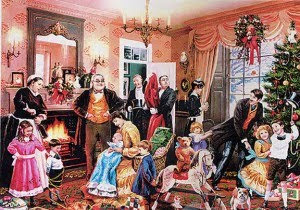 It is interesting that folks "kept Christmas" in much smaller, quieter, different ways prior to the Victorian era and all of the changes brought on by the Industrial Revolution. For all my love of English history, I've never had plum pudding. I popped into a Williams Sonoma store and saw that they're selling pudding pans (or whatever they're called) that you use to steam the puddings. It might be fun to make one, but I've also seen what goes into those puddings and I can't say I'm chomping at the bit. We do have a few food traditions each Christmas. My German(ish) husband's family makes stollen every year. It's quite a process. Thanks so much! God bless us, everyone! Susie, I use a coffee can. It's getting harder to find metal ones, and ones that aren't sloped in at the top. The pudding must be able to slide out! The can gets set into a big kettle. Sometimes the can wants to float. I cover it with aluminum foil and put something heavy on it. Then steam it for a long time. Then you get a really moist, heavy baked bread. The best is to eat it warm with warm nutmeg sauce, sometimes brandied or at least a touch of brandy flavor. Anyway, it's a recipe handed down from my English great grandmother. I'm the only one who likes it, unfortunately, so I'm going to try to make a small one this year. Actually, Christmas, in England and during the colonial era at least in the South, which was much closer to English ways than New England, celebrated Christmas quite uproariously. Wasailing went back centuries, and was a drunken revel by the end of the night. Englishmen sobered up a bit, relatively speaking, after the French Revolution, not wanting things to happen to them, as happened to their French counterparts. But Christmas puddings, with prizes inside,the Lord of Misrule, and numerous songs like The Holly and the Ivy go back long before Victoria and Albert. Yule logs and mistletoe go back even further.